Week 7 was filled with life so nothing was done on this project. Hopefully I will have some time this weekend. Fingers crossed! 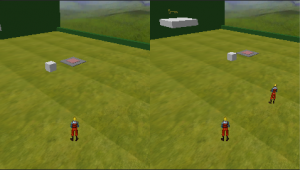 Changed usage of UsableObjects to always have trigger area the player must stand in, and then player must look at the object to use it. Look to use is done with a Raycast on Usable layer. Added a Pickable layer for picking up objects. This raycast is done every frame. If it is too expensive, I’ll set the raycast at 5fps. Added a shadow on the player using a Projector in orthographic mode. Or should the shadow get larger when jumping (perspective mode)? Also added fake projector shadows on platforms. Sound played when picking up key and opening door. The carrying of objects is not the best at the moment. Just lift up the object in the air and parent it to the player with physics off. This has some unwanted (?) sideeffects of moving that object through the wall. Also it will get stuck on the movable platform. Also… it is visually in the way. Perhaps it could be semi-transparent. The raycast is casting its ray from the head diagonally down. This might miss small objects, so not sure if I should cast it from the head and 1m out to straight down to the ground instead. I think it might work better. The raycast for picking objects has same problem, casting it from the feet and straight out 1m. Will miss stuff that is not on the ground. Will experiment with this next week. Carry objects: Carry the object above the head? Carry it straight out like now, but with physics so it blocks (harder to fix?). Skyboxes: I want different skyboxes for different worlds to set the mood. Mecanim: The Mecanim system will be used for animating instead, as it is much more versatile. One mecanim animation should be usable on all models. Speed should match player speed, so it won’t look like the player is floating. Controls are still the same as in week 2, but also the 4 key will do topdown camera mode and free control mode. Switched back to default model, so the jump animation is visible. Added support for multiplayer splitscreen. NGUI ui for usable objects. Try the door. Changed skybox to something with a ground. Switched terrain for a simpler level. Dying takes you back to your spawn point. I do not have a second level yet, so clearing this level won’t take you to the next one. This will be implemented next week. Currently my UsableObjects must have a box trigger collider for getting player to know if it is usable. I’ve been thinking that maybe I should use RayCast from the player and a small distance forward to get the usable objects instead. This would simplify creating usable objects, but might be unnecessary CPU work. I will try this out when I get my OUYA. NGUI gui is progressing. I now have a nicer looking popup when moving to a usable object (door), and when the required items for using that object is in your inventory (when you have the key to the door), a USE-button will appear. When clicking that, the object is used (the door is opened). I’m going to prettify the code some, then I will upload it this weekend, along with a new playable web version. * Got the jump animation to work for default character. But I switched model just for fun. I could not use old animations on new model, so I’ll have to check out the mecanim system some more. * Point/Click control mode now works. * Updated the WaypointsMover. Now can pause at each waypoint. 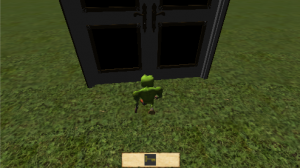 * Added a UsableObject class, which I use on the door. Go near the door and items missing to use the door will show at the top. Will you be able to open the door? 1,2,3: A mix of control+camera mode, like it will be in the final game. Next weeks focus will be on adding a gui with ngui. Also I will probably not use a terrain, but simpler objects and perhaps use a toon shader. Simplified SeekSteer and made my own script for moving objects between waypoints. The MovingPlatform now works much better. * Attach to object. Moves object between waypoints. 1: FPS style. asdw/arrows for movement and mouse for looking. 2: Third person view. asdw/arrows for movement and looking. 3: Top down view. Same as above. 2,3: Raisable camera with mouse scroll wheel. Switch pad with button. Walk on it to trigger the movable platform. Alternatively push the box onto it, so you can jump up on the platform. The movement script for the platform is … bad. Too be continued. So I wanted to use an interface reference as a public variable, but it wouldn’t show up in the inspector. After many hours researching and trying different things, I finally settled for using abstract classes instead, and using the unity way of adding scripts to objects as my interface. I made a pad with a button on it. This button is my switch. When something (player or box) moves onto it, it should trigger an event in another target object. So I wanted to have a SwitchTrigger interface for the target of my switch object. // This object has been turned on/off. * allow interface objects as public references in the gui. Then I have to create an explicit class inheriting this abstract class for the specific GameObject I want it on. I then add the script SwitchTriggerTarget to my MovingPlatform object. MovingPlatform object also has a MovingPlatform script, which basically just makes sure other objects on MovingPlatform object follows it when it moves. This is done by parenting. // TODO: Add objects on platform to an array. // Save old parent on enter, reattach old parent on exit. The platform movement is done by another script. Just add the modules you want onto the GameObject, and then make a prefab of it. Modular and nice. Now, my SwitchPad (the one you walk on to trigger the button), looks like this. // Send trigger message to linked object. // Play on animation, if available. // Play off animation, if available. The highlighted row: By using the abstract class as the type, only GameObjects with scripts inheriting from SwitchTarget, like MovablePlatformSwitchTarget, can be dragged onto the target in the inspector.